Cooking with the French method is as easy as can be with this sous vide machine. 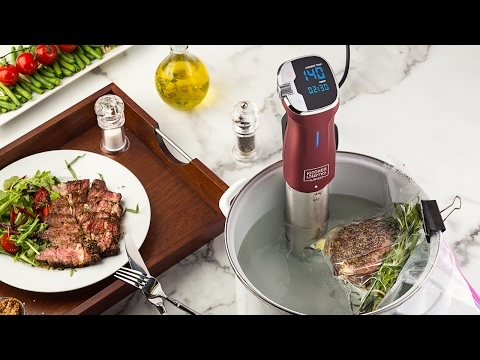 This immersion circulator heats food at a low, constant temperature. This constant, steady heat cooks food evenly from the inside out, without overdoing it, delivering consistent (and delicious) results, right at home. Works great. Really does the job on virtually everything i’ve Cooked with it. With a sous vide machine in the kitchen, whipping up restaurant-style dishes is easy. 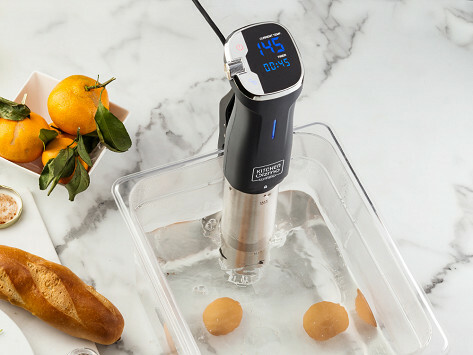 Though the French method may sound overly complicated, getting delicious sous vide results is totally doable for any home cook thanks to the immersion circulator from Kitchen Gizmo. The slim design is low maintenance but highly performing. There are no bells and whistles, just pared-down functionality that we found intuitive to use. Just set the timer and temperature, and the circulator takes it from there. It keeps the heat consistent, so food cooks evenly. This is especially great for cooking meat, because it keeps things perfectly pink and juicy inside without overcooking the surface. There’s a recipe book for inspiration, or you can wing it, like we did—and we still ended up with delicious steaks (just sear the outside before serving). This streamlined tool keeps things simple, so you get tasty and impressive results.